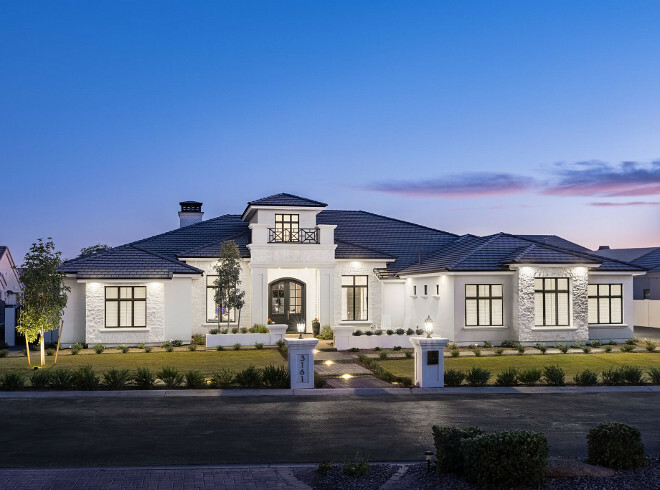 This custom residence was the first “ground-up” spec home for A Finer Touch Construction. 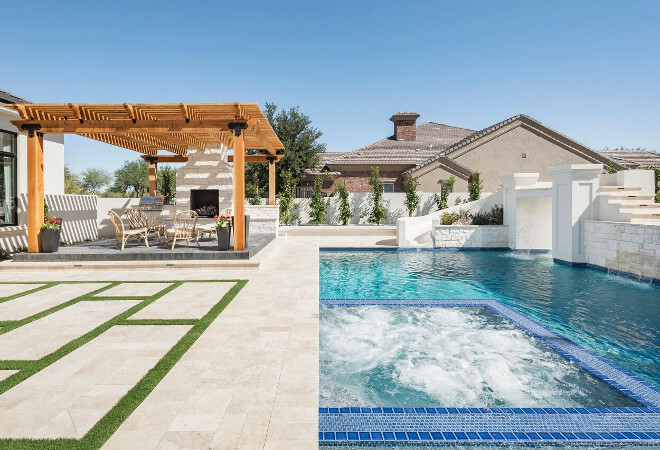 One of their main goals was to create a home that is unique from all of the others in the greater Phoenix area. 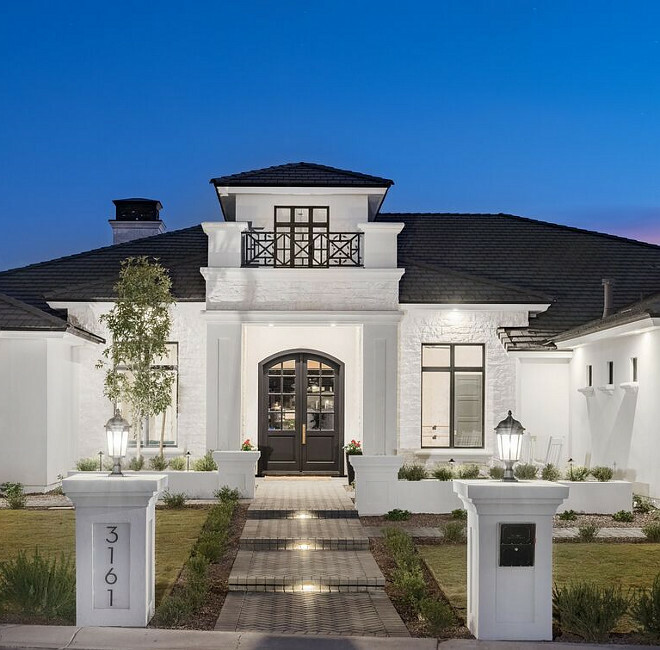 The builder wanted a single-story home with large ceilings throughout and so the heights range could from 22 feet in the entry to 10 feet in the secondary bedrooms. An open floor plan with a nice “flow” was a must. They designed incredibly wide but minimal hallways. 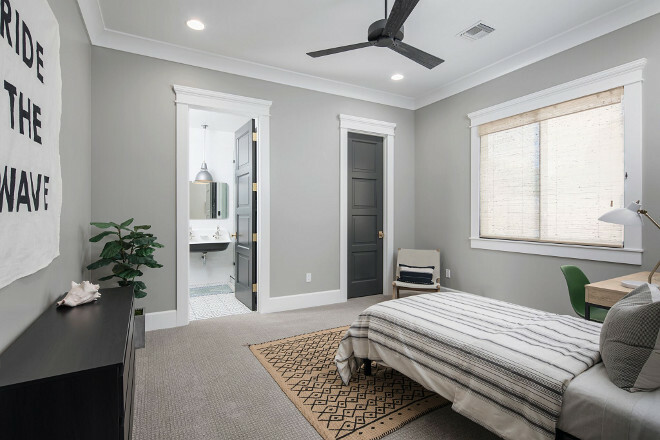 One of my favorite features is the master suite. The master closet is the largest secondary room in the home, outside of the master bedroom itself. 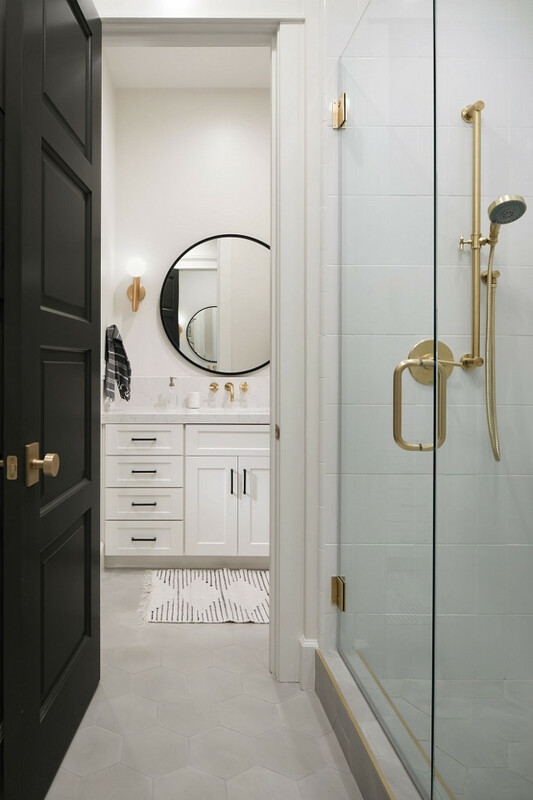 The master bathroom features 12 foot ceilings with an incredibly large walk-in shower. 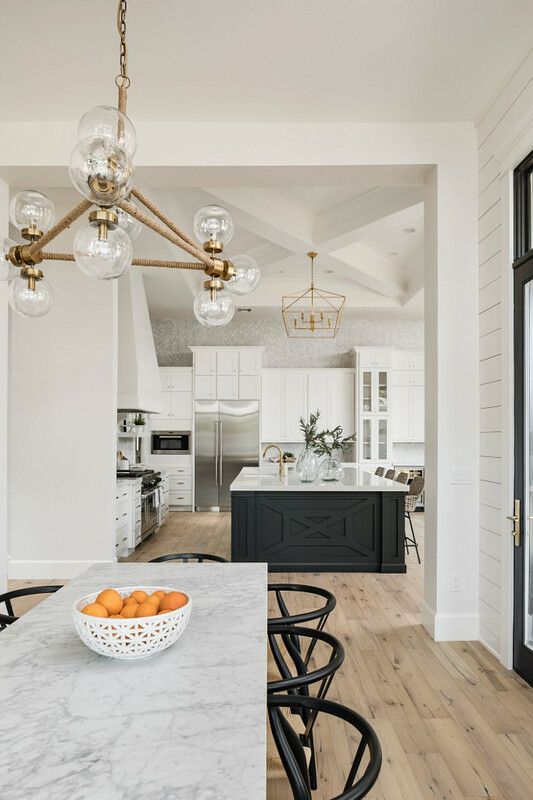 This home is so perfect that as soon the builder posted a rendering of the home and the current floor plan, a young family saw it and jumped on the opportunity to purchase the home. They were able to make some personal touches to the interior. Read on and get to know more details shared by the builder. 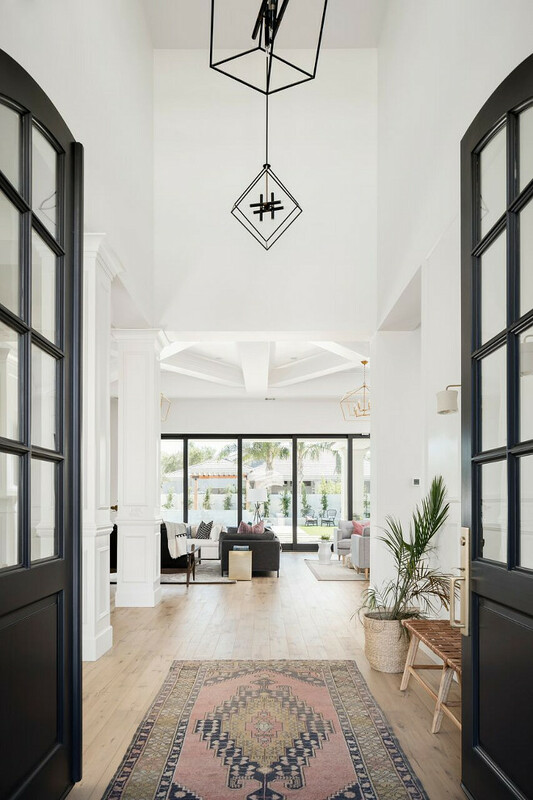 This double entry door and custom trim work makes quite the statement entry. Front door paint color is Iron Ore by Sherwin Williams. The front doors open to a gorgeous foyer with crisp white paint color; Dunn Edwards White Pickett Fence DET 648. Lighting is Shades of Light, Be Squared Modern Chandelier. Sconces are Cedar & Moss Wyatt Sconce. Bench is Flanders Bench from Jason Home. Similar woven leather bench can be found here. A piano room is located just off the entry. The mid-century chaise is from West Elm. Similar rug (piano room) can be found here and here. Flooring is Provenza Floors – Heirloom -Liverpool, with oil finish – 6.25″ W.
This is the ultimate in kitchen design! I truly feel inspired by every detail. 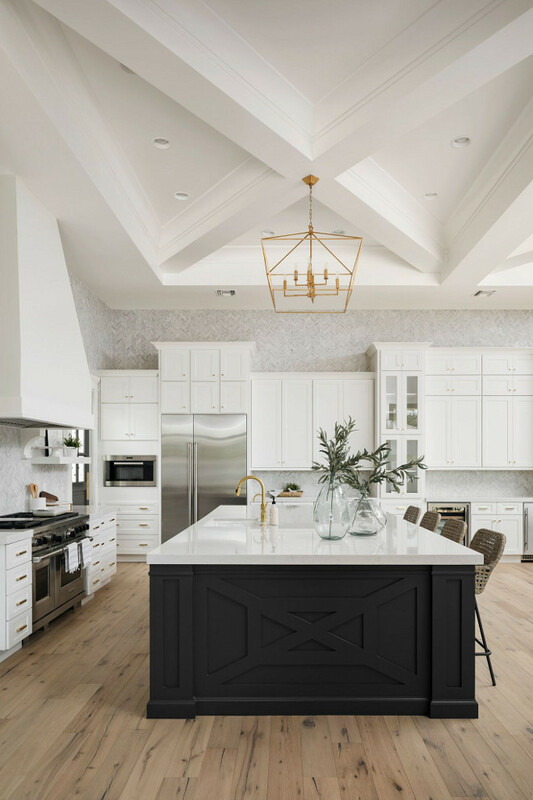 This kitchen features Wolf Subzero appliances, custom built island and hood and decorative 14-foot ceiling. Counterstools are Bailey Woven Stool from Ballard Designs. All of the countertops are Cambria Swanbridge (throughout the entire house – 9 slabs in total). 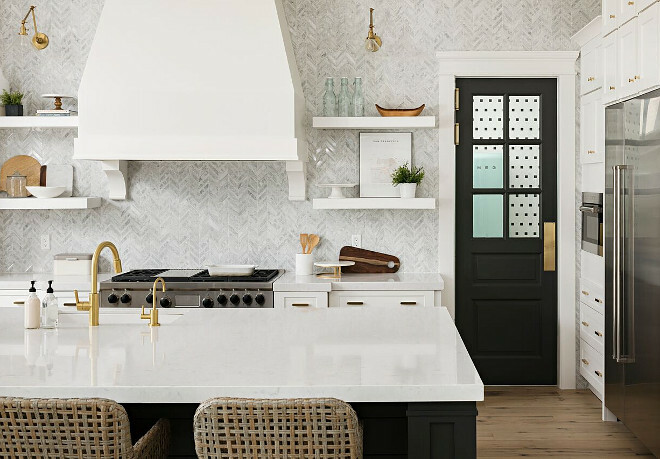 The backsplash is chevron patterned marble. Lighting is Gabby Lighting’s Adler chandelier – no longer available in brass – only in bronze. 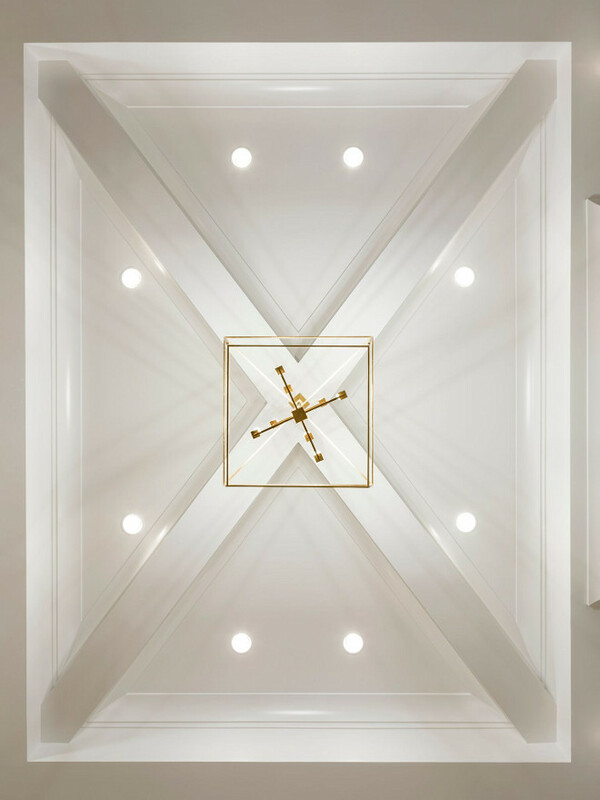 There are 3 decorative “X” ceilings spaced evenly throughout the great room and kitchen. The ceilings are 14 feet to the peak and 12 feet to the soffit. The black island is painted in Iron Ore by Sherwin Williams. All of the kitchen cabinetry ranges from 9 to 10 feet tall. Kitchen is 7 feet by 13 feet. 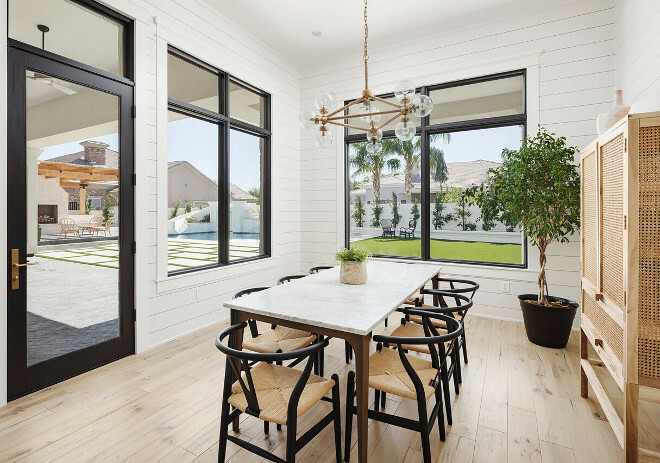 This minimalist modern farmhouse dining room features shiplap walls, black windows and patio doors, wishbone dining chairs, marble top dining table, bleached hardwood floors and modern glass and rope chandelier. Cabinet is Urban Outfitters Marte Storage Cabinet – no longer available. Lighting is Bobo Intriguing Rope Globe Chandelier – more affordable option can be found here. The wishbone chairs are from Amazon. 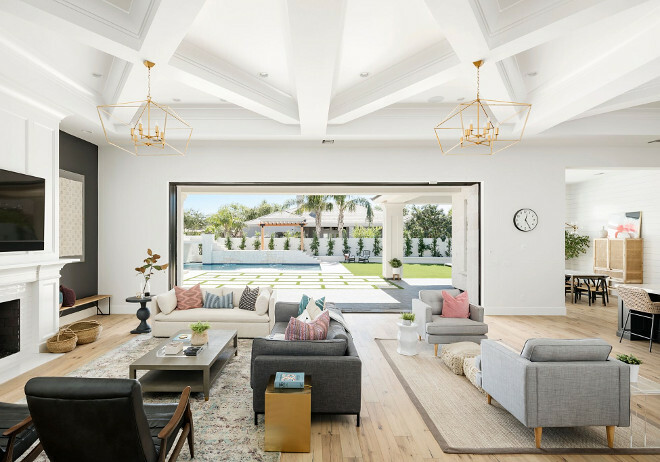 A large great room is the perfect place to entertain friends and family. 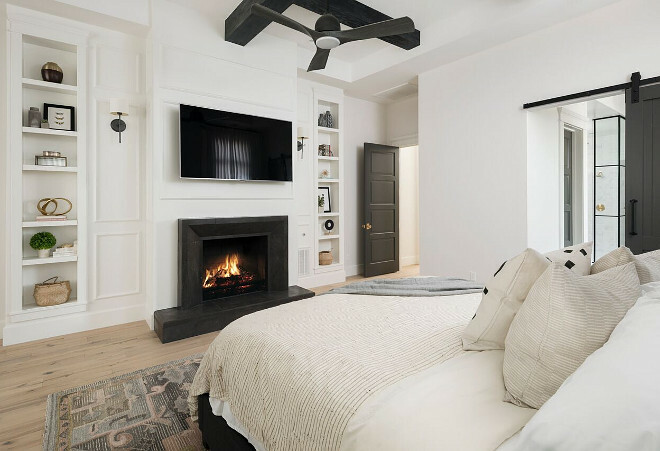 The great room features 14 foot decorative ceilings and black accent walls on either side of the Isokern fireplace selected by the interior designer. 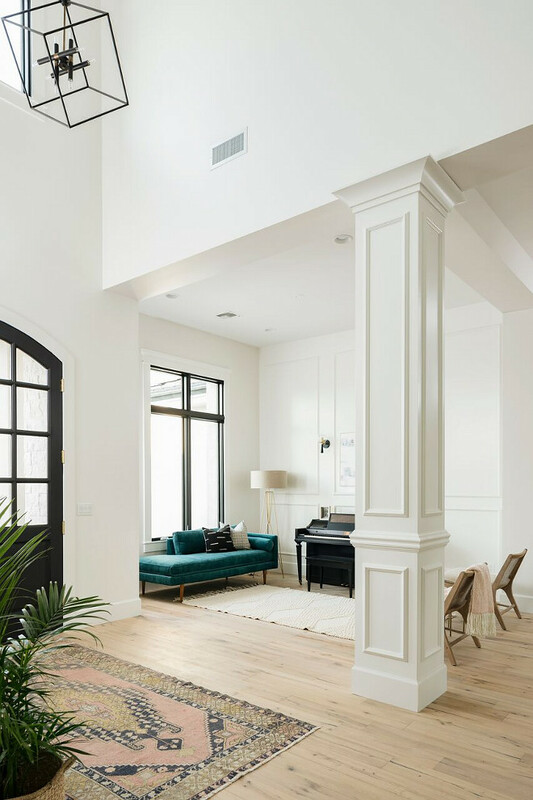 The columns and fireplace are then fully wrapped in custom trim work. And to top it off, you’ll see the 25-foot automated multi-slide pocket door, wood flooring and custom light fixtures. I am loving the simplicity of the mid-century inspired furniture. Similar Grey Sofa: West Elm. 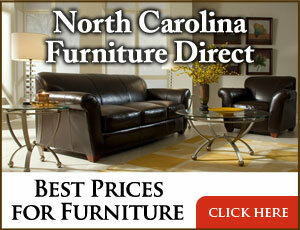 Similar Black Leather & Walnut Chairs: here. Similar Leather Wrapped Coffee Table: here. 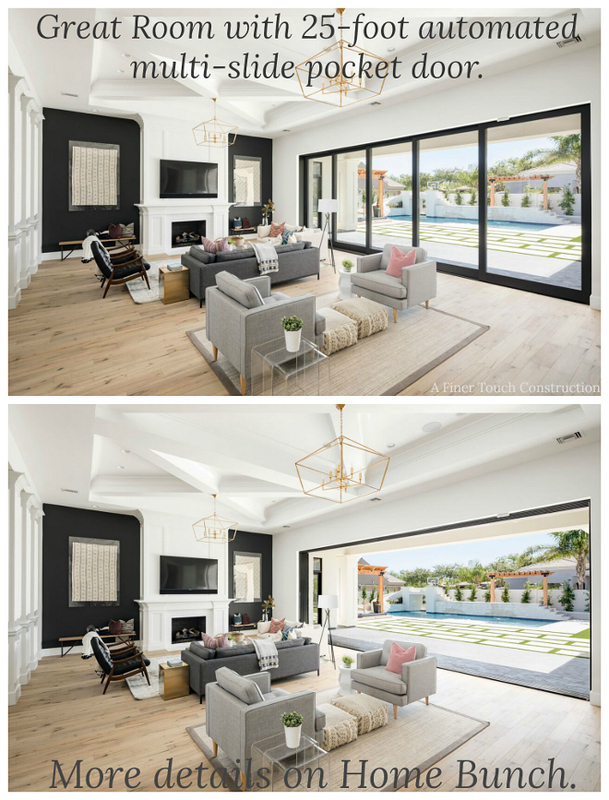 This large great room features two distinct sitting areas. “X-Men the ceiling”, as appropriately named by the photographer. The visual symmetry of this ceiling is even better in person. The framers took three days to lay out this ceiling on the floor. The entire room had chalk dust as the framers ensured that every soffit and decorative X were perfectly lined up. They built the entire ceiling in sections on the floor before we it was raised and attached to the trusses and exterior walls. It truly was a work of art. The drywallers, electricians, trim carpenters, and painters then followed with precise craftsmanship to the image you see here. 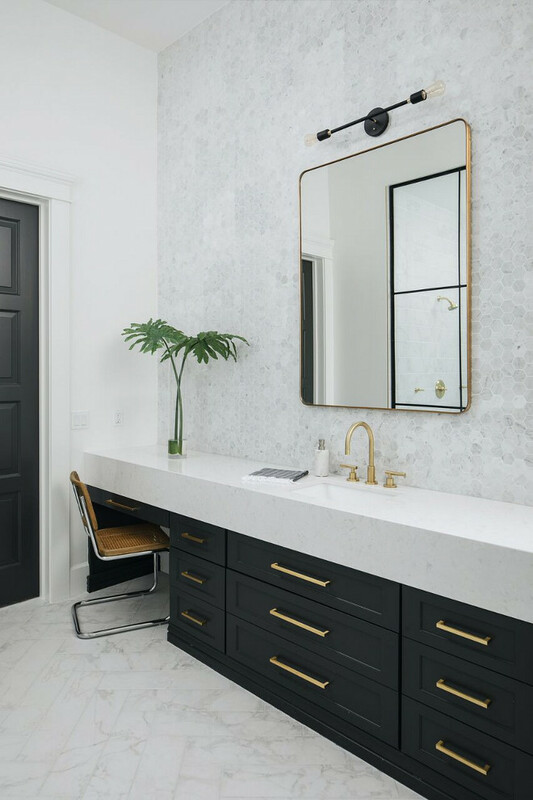 This powder room features a stunning custom vanity with white quartz countertop, shiplap walls and cement tile. 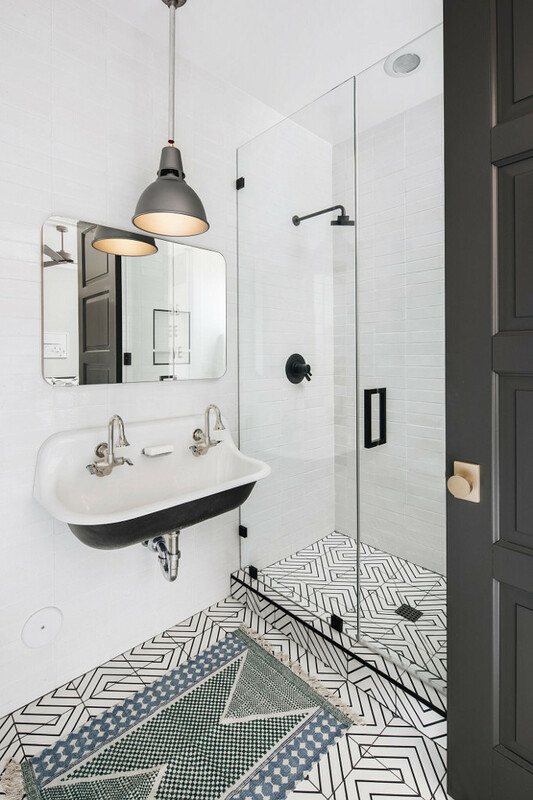 The cement tile is Estrella Black Pattern from RiadTile. Brass Faucet are Newport Brass. Sink can be found here. 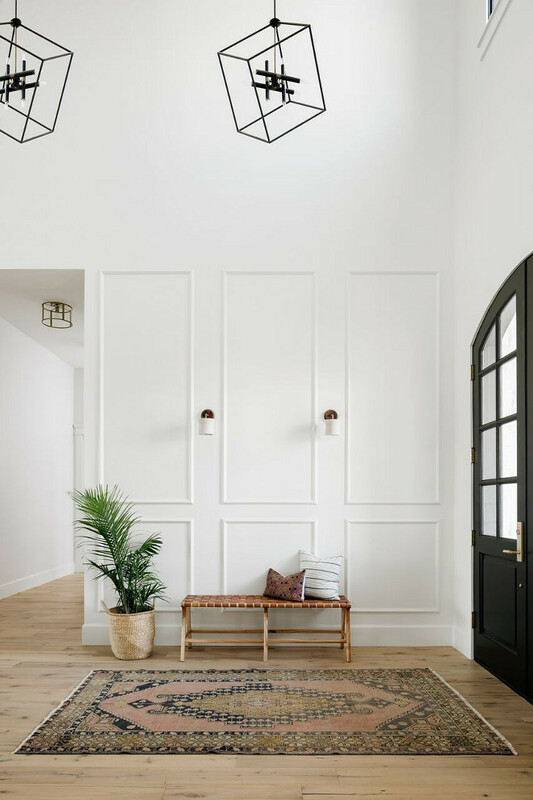 Lighting: Schoolhouse Simone Single Sconce. 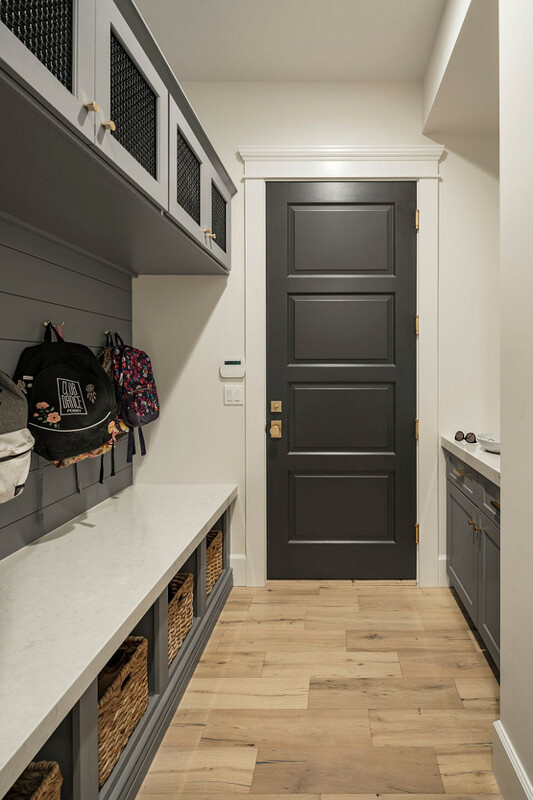 The mudroom features grey cabinets painted in Sherwin Williams SW7670 Grey Shingle. Key Drop Sconce (not shown): Rejuvenation. 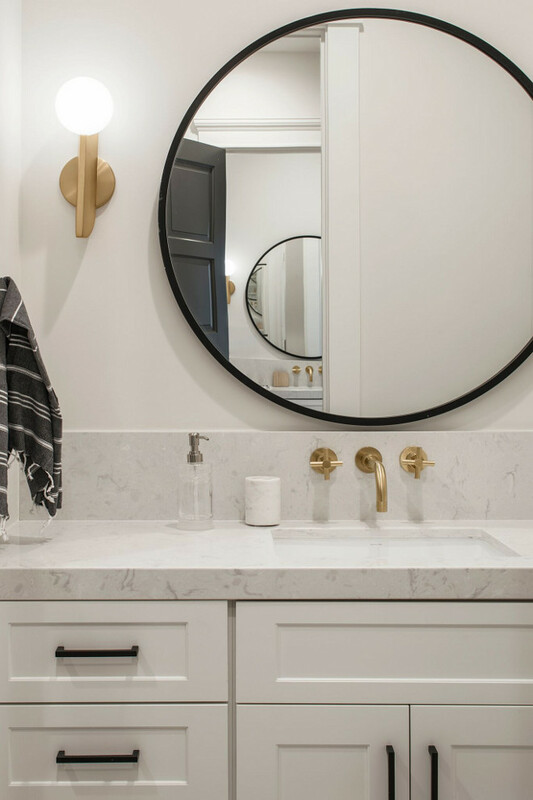 From the builder: “It’s rare that we have the opportunity to build a laundry room that is one of the prettiest rooms in the house. 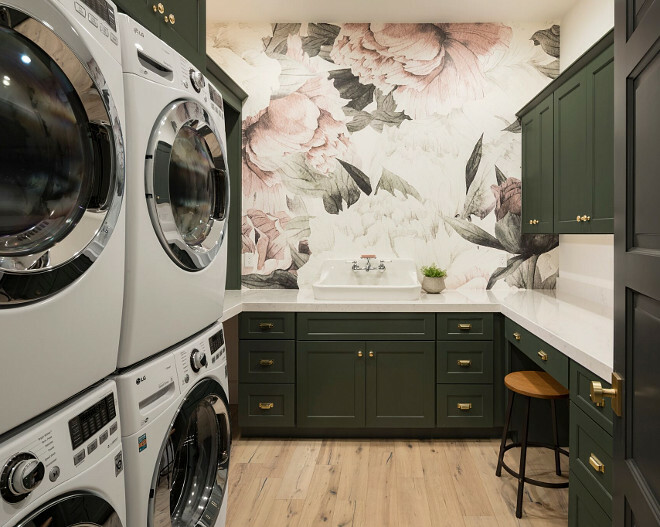 One of our favorite details in this laundry room is the wallpaper chosen by our designers. 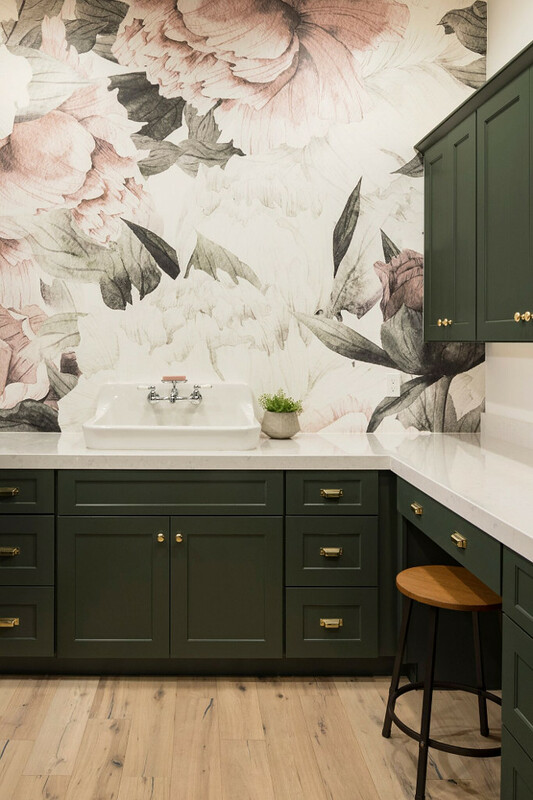 The Benjamin Moore Forest Green and Cambria quartz countertop are also a fun element. 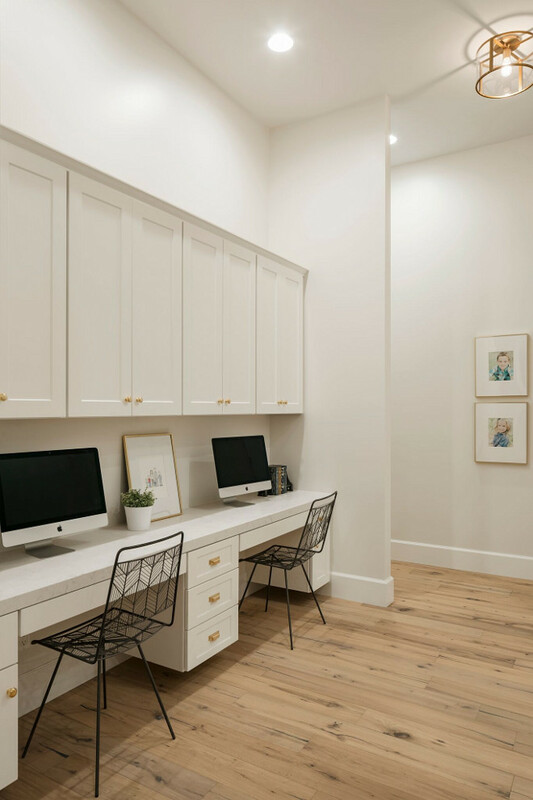 The dedicated laundry also serves as a craft room with double desk cabinets and computer hookups. 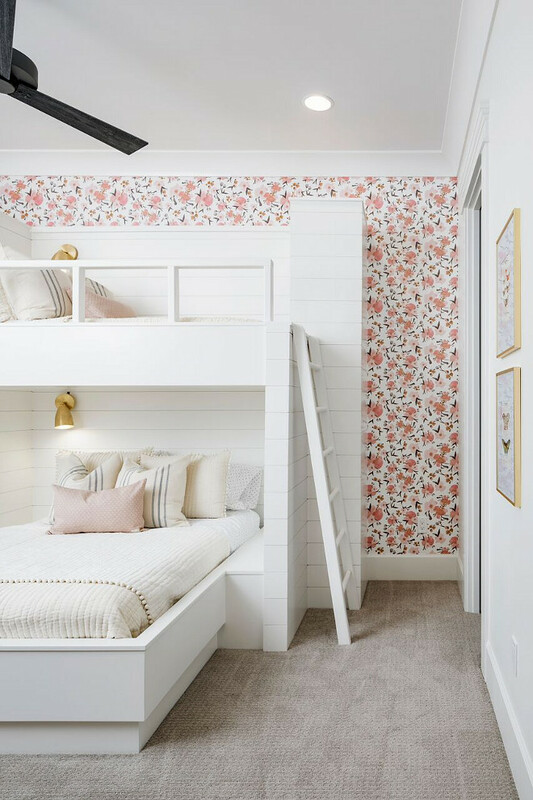 In lieu of a standard storage closet, the interior designer and builder reconfigure this location for the kids homework area. They installed floating cabinetry with matching uppers and then prewired low voltage for the computer stations. And of course, wood flooring throughout. 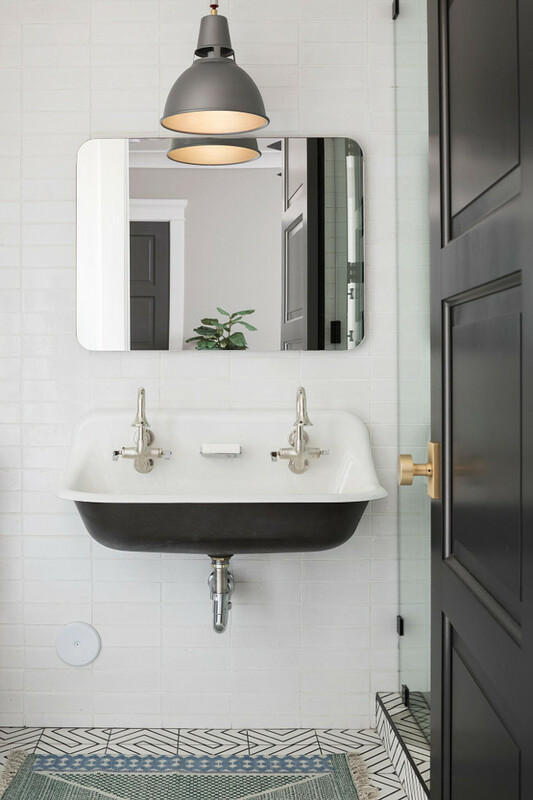 Brass Flushmount Lighting: West Elm. Mid-century inspired furniture is also carried to this space. 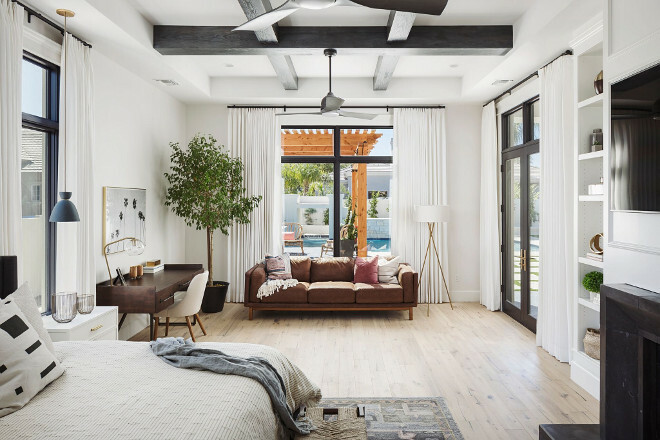 The master bedroom features a large sitting area with view and access to the backyard. Ceiling: White oak beams painted charcoal gray. 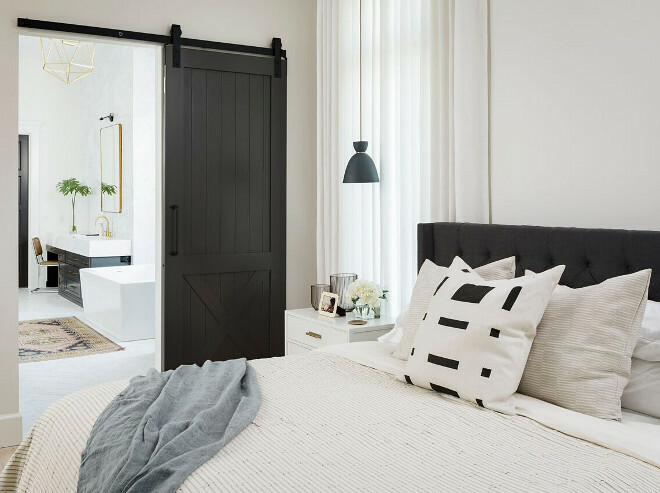 A dark stained barn door opens to the master ensuite. The master closet is the largest secondary room in the home, outside of the master bedroom itself. Capiz Chandelier is from Horchow. This spacious walk-in closet features a large island and laundry machines. 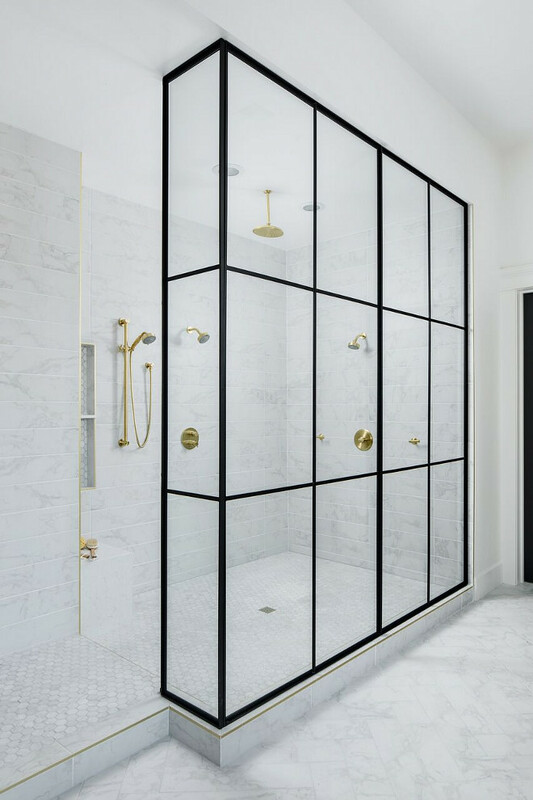 Notice the floor-to-ceiling hex marble tile and the gold Schluter trim. Brass Faucets are Newport Brass. Sink can be found here. 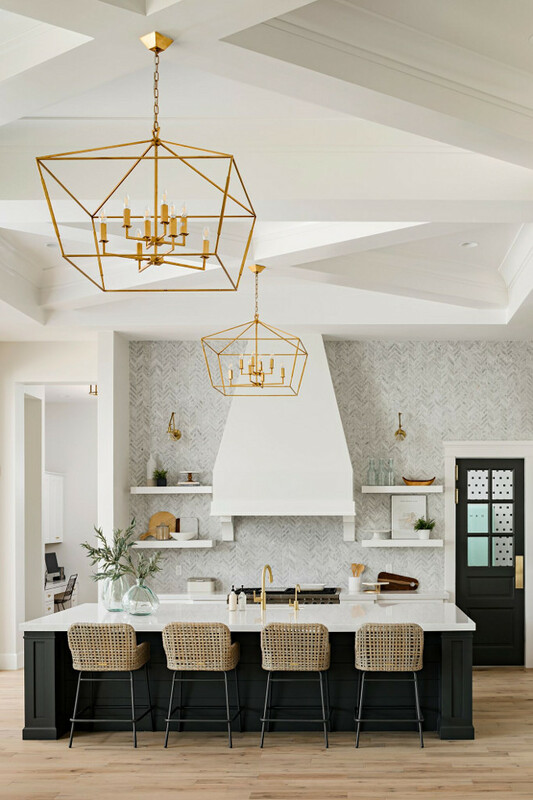 This gorgeous brass pendant is from Anthropologie. The “Sherwin Williams Iron Ore SW7069” painted clear alder cabinets are the perfect contrast to the 8” Cambria waterfall countertop edge. Flooring is Carrara Matte 6 in. x 24 in. Glazed Porcelain Floor Tile. Master Bathroom Tub: The interior wood windows are also painted Sherwin Iron Ore, but the trim and casing are white. 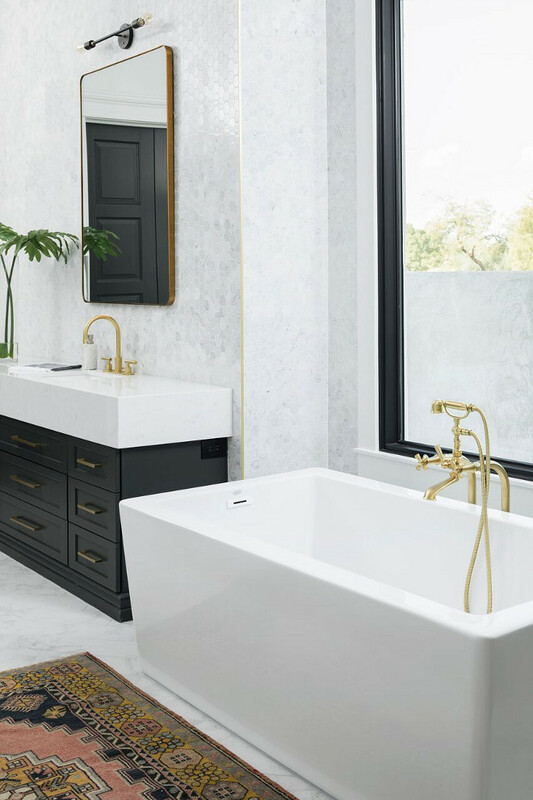 Throw in a large soaking tub, gold Newport brass plumbing fixtures, and gold cabinet hardware to top it all off! Tub Filler: Jacobean Exposed Tub & Hand Shower Set – Wall Mount BRASSTECH-Newport Brass. Floor tile is Bianco Carrara Hexagon Marble Mosaic. “The perfect wall mount sink for the ideal boy’s bathroom! 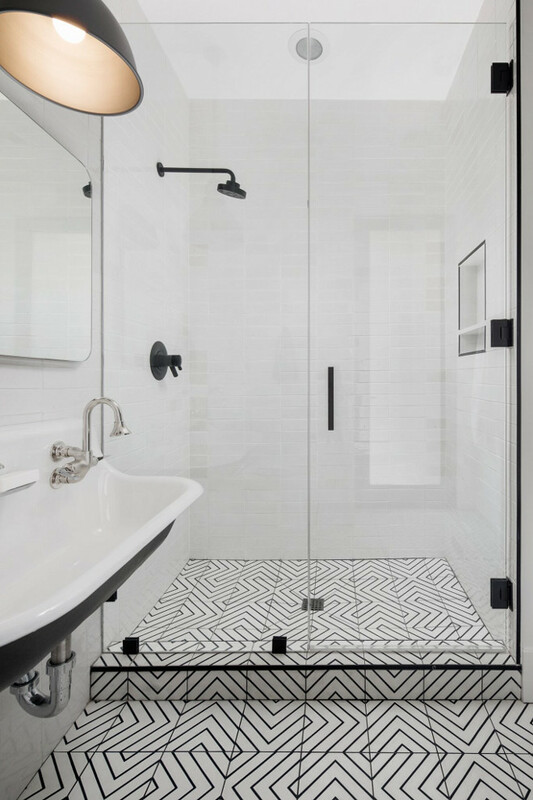 I love the chiseled “floor to ceiling” white wall tile and the black and white concrete tile floor. Kholer sink faucet can be found here and the Kohler dish soap can be found here. Bathroom floor tile is Zenith Moroccan Encaustic Cement Tile from Cle Tile. Notice the Black Schluter trim around the shower. Lighting is Schoolhouse Factory Light No. 6 Rod Pendant. Similar at Rejuvenation. Mat is from Urban Outfitters. 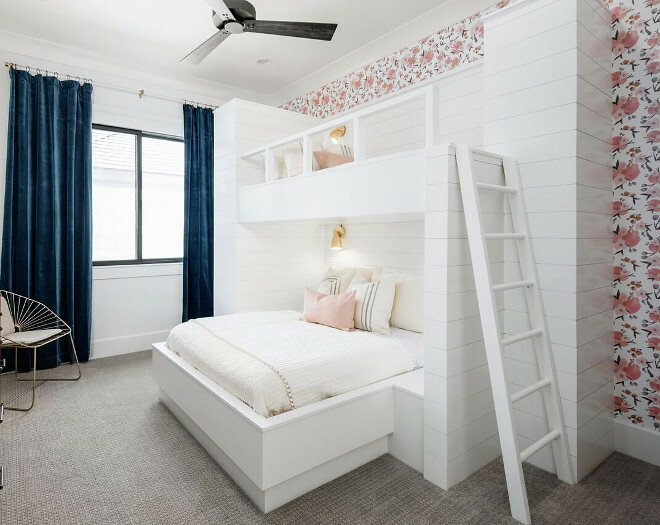 This neutral farmhouse bedroom feels calming and inviting. 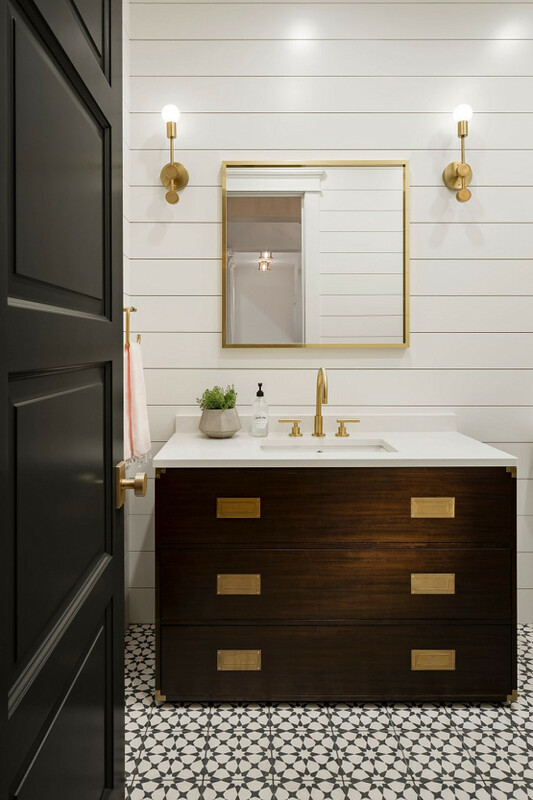 Isn’t this modern farmhouse Jack & Jill bathroom full of great ideas? 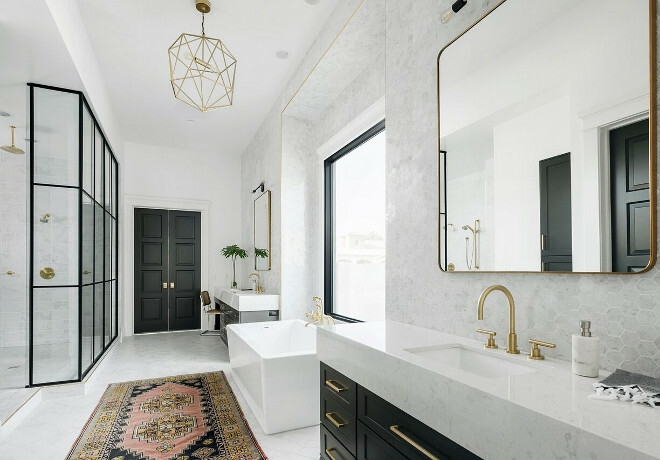 I love the mix of gold and black and the grey hex cement floor tile. Hex tiles are from Cle Tile. 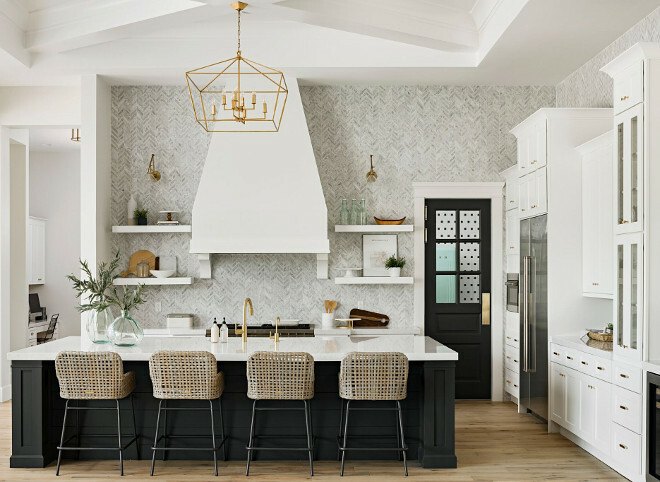 New Farmhouse Trend: Mix black metal with gold. The gold sconces are from West Elm. Similar round metal mirror can be found here. Isn’t this dance studio dreamy? Imagine how much fun the kids would have! The bathroom features a frameless floating vanity with a greywash finish. The lotus wall tile is Villa Heirloom Linen Lotus Porcelain Mosaic – similar can be found here and here. Abaca Woven Pendants are from Burke Decor. 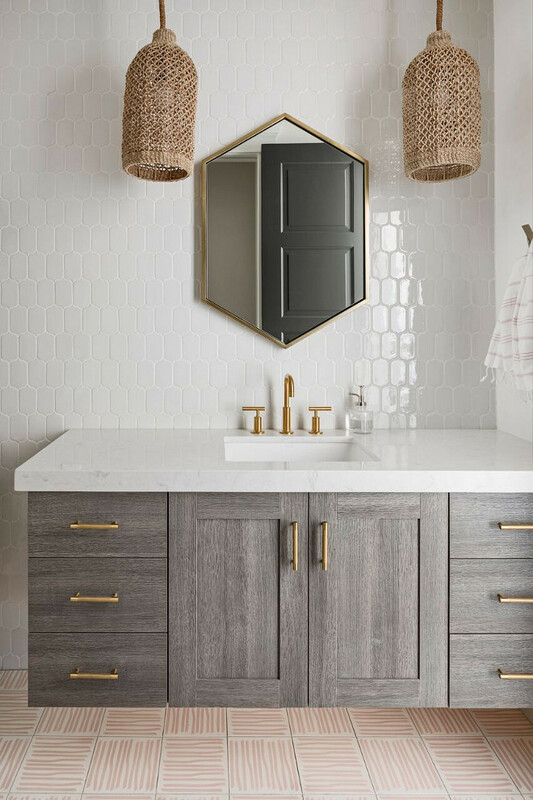 The brass Hex mirror is from West Elm. Floor tile is Cle Tile -Cement Tile- Encaustic Victoria Larson, laid in an alternating pattern. 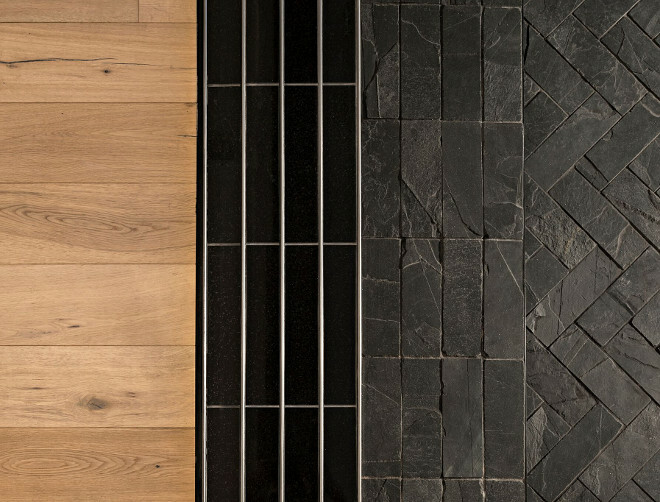 The patio features black slate tile in a herringbone pattern. 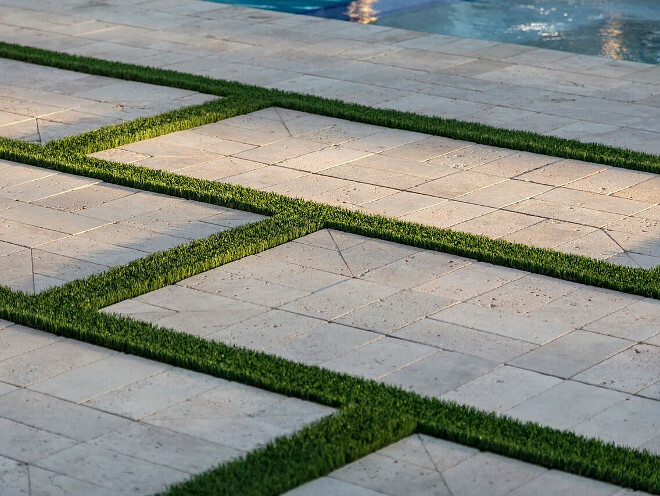 Gorgeous stone patio with grass. Gorgeous! 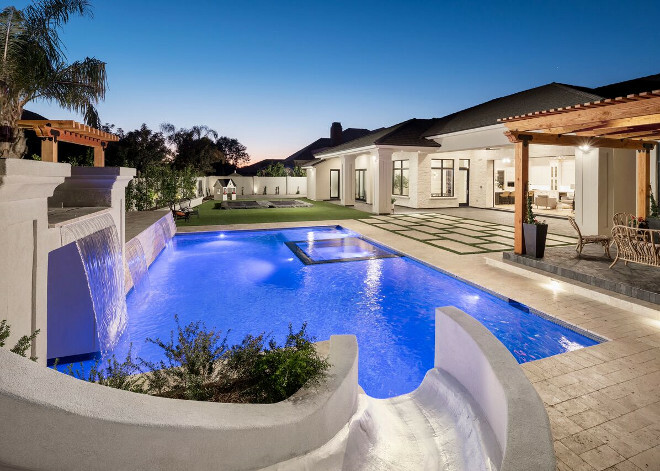 The patio doors open to an expansive backyard with two underground trampolines, playhouse and a pool area. This entire backyard was perfectly designed. Which one would you choose? 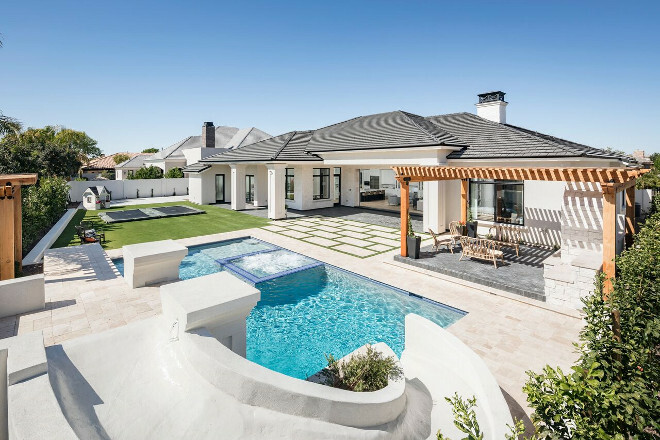 Pool or spa? 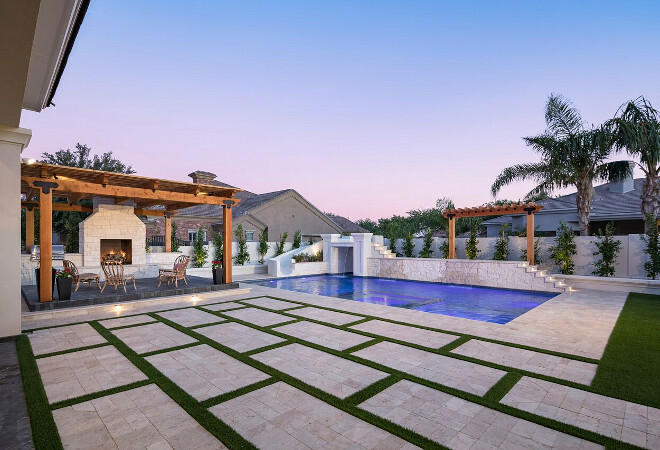 This backyard is perfect for entertaining! 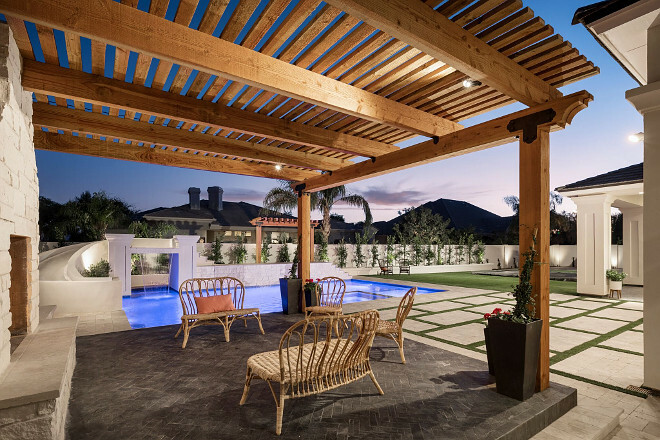 A large patio opens to the pool area and pergola. Isn’t this slide so fun? 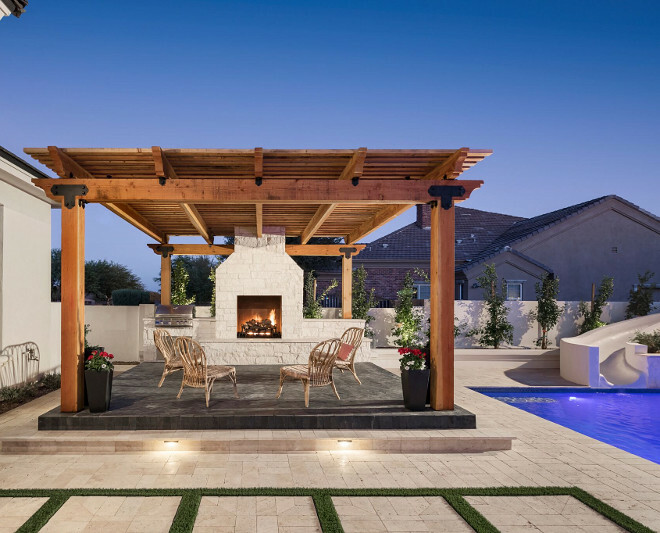 What better place to spend your time than outside at this gorgeous fireplace and trellis. As a bonus, if the fire is too warm, you can just jump in that amazing pool! 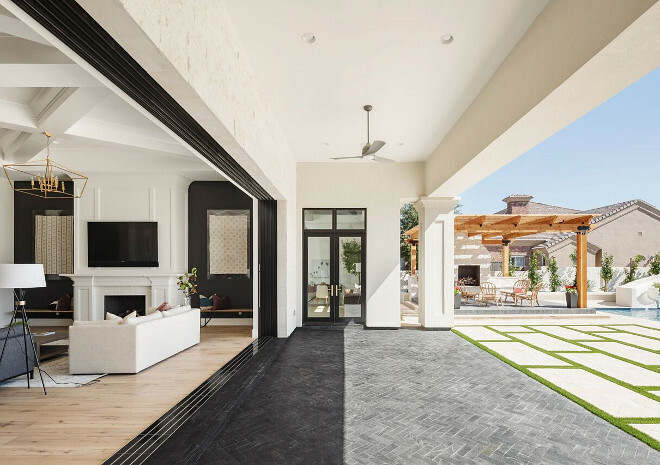 The pergola carries the same black slate herringbone flooring. 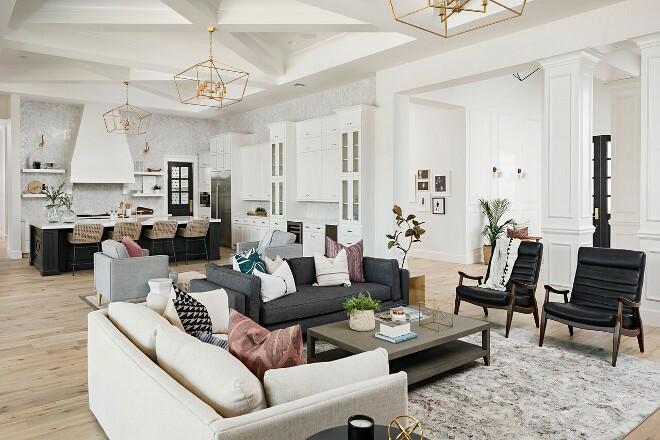 This home is truly dreamy – inside and out!!! Builder: A Finer Touch Construction. 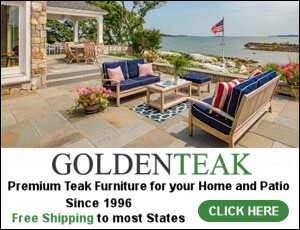 Best Sales of the Month! 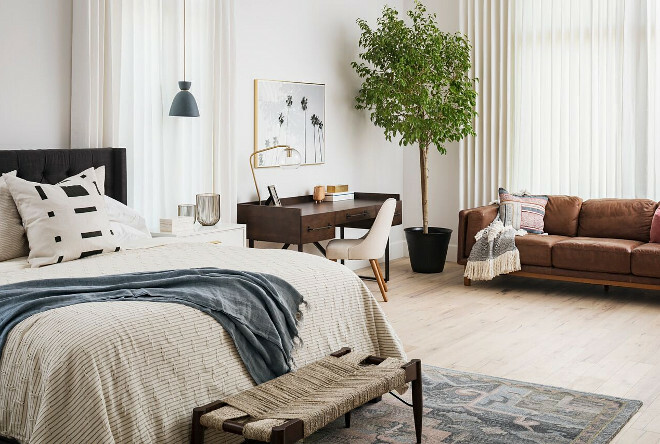 West Elm: Up to60% Off + Free Shipping. Joss & Main: Huge Sales – Up to 75% OFF! This home is beautiful. Stunning. 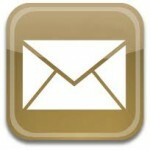 Beautiful post…as always! I am a huge fan and I endlessly PIN/Pinterest your blogs. I keep getting an error message indicating that Pinterest is blocking the site. Is anyone else having an issue? This is an error coming from Pinterest. I have emailed them several times since Friday and I haven’t heard anything yet. If this continues, I will need my readers to support me and start writing to them as well. It’s very frustrating because I haven’t done anything to this to happen. I really hope Pinterest can fix this soon!